There is a certain allure to the practice of letterpress printing, which is currently seeing a popular resurgence, particularly amongst artists and designers (here's a recent article!). Not only is the end result both tactile and unique, but the practice itself is steeped in history. Printing presses that allow for the use of metal and wood type are no longer made, so the ability to even begin printing is largely dependent upon one's access to the right equipment. Cannibal Paper Goods is lucky to have two excellent printing presses right in our studio, each with its own history and potential. 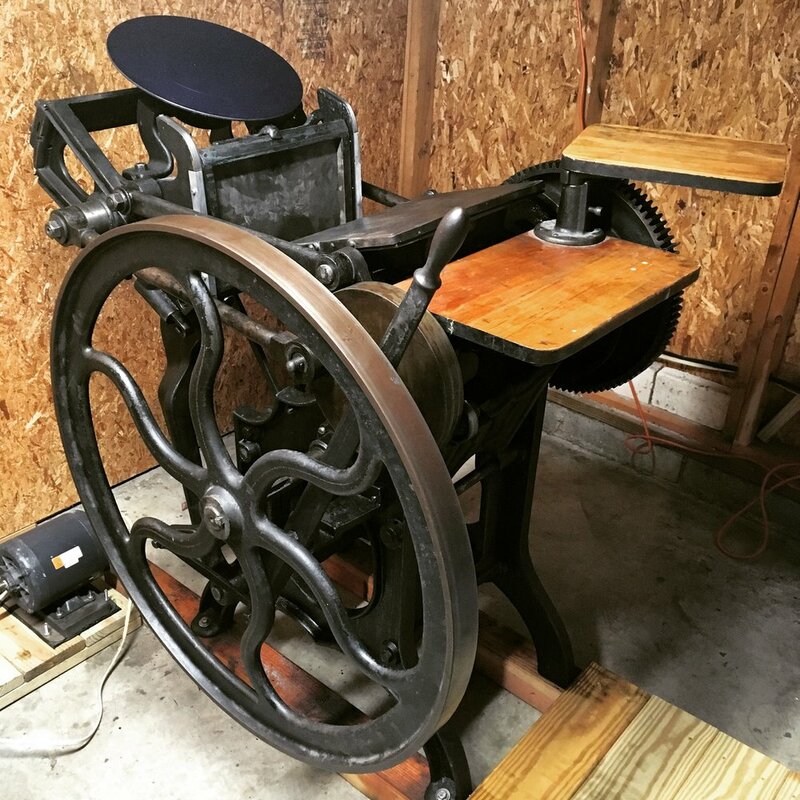 Our C&P platen press is a little workhorse that weighs about 1200 pound. Manufactured in 1909, this printing press spent most of its life hanging out in Pittsburgh, where it remains today in our studio. It can be run either by electric motor or foot-powered treadle and is great for printing greeting cards, wedding invitations, business cards, and other small-to-medium sized goods. We are currently restoring a mid-century Challenge proof press. This printing press spent most of its life printing funeral programs in Eastern PA. With a 14 1/2 by 28 inch printing bed, this press is capable of printing jobs large and small. Images coming soon!